My Mother was a remarkable woman. She may not have been perfect but she was a good woman and she loved me. On her death bed – her Angel Day - she looked at me lucidly and with a solemn voice said “I love you so much”. I discovered many things about my mother during her last months. She was a gentle soul really, a positive and strong person who fought hard for her survival and thrived in the process. Frances Louisa Shriner as a child of 1 year; a woman of 18; as a crone of 80.
settled in Thorold during the 1770’s and their property was the battleground for one of the bloodiest battles in the War of 1812 – the Battle of Beaverdams where Laura Secord warned Col. Fitzgibbons. The creek that ran through their property was named after the family – Shriner’s Creek which in now a valued watershed. Why do I say all of this? 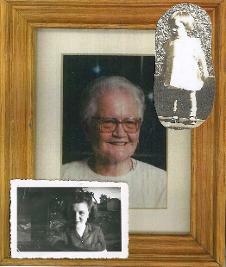 Because my Mother stood on the shoulders of giants and she was very proud of her ancestry. Because of her loyalty to this city (Niagara Falls, Canada) I followed in her footsteps and continued research in the family stories and became aware of how human they and we all are. Our family played many valuable roles in the very beginning of Canada. Her accomplishments were outstanding. When Frances Louisa first began her 25 year real estate career she was one of the first women to successfully achieve top listing and selling status in the city. She did this without access to more than half the available listings because she was a woman. Yet she thrived! I remember a Christmas around that time. We lived in a house that had a large living area. When I came downstairs there were presents out to the edge of the room and we had to work our way to the tree while opening all the presents. It was a great Christmas. And then there were Christmas, Thanksgiving and Easter dinners – among others – my mother was a great cook – Easter egg hunts, Halloween costumes and Mom’s candy apple treats, birthday parties, running through the rain in our bathing suits. And oh, yes, there were many Valentine cards for my elementary school mates. It was all a lot of fun. She loved the idea of family and celebrated that whenever there was something to celebrate. In 2008 she received her 30 year volunteer pin for the Ontario Volunteer Service Awards for her work with Nova House and in fact sat on their first Board of Directors. About thirty-five years ago preventing violence against women (VAW) was not a popular cause. However Mom was a visionary and believed as we do today that VAW is preventable. Together with Dr. Felicity Cox they began the Book Riot for Niagara Nova House which is still an ongoing fundraiser. She designed, researched and implemented the Peach Queen Festival which is still a going concern. She loved the blossoms and wanted to celebrate those. Mother supported the United Way and had great times at the Poor Boy Luncheons. She gave her time and money to charity when she could; volunteered at FACS as a clerical worker, driver and visitor; active in a home & school association; answered phones at telethons; organized family reunions after much research in her Shriner family geneology. There are many other volunteer activities to mention but it is easy to say she loved her city very much and did as much as time allowed while selling real estate and raising 8 children. A parent can only do their best as I told her many times in the end. She protected her little ones in her own way from the monsters hiding in the shadows. Without Mom’s guidance and love I certainly would not be where I am today. I asked her one time “Once someone has been impure can they be pure again?” She replied “Purity is in thought dear”. Mom was (and still is) a big part in my life and guided me in many ways to understand what I still strive to understand. Without her guidance I would be surviving instead of striving and thriving. Over the years I would ask the inevitable youthful questions and she would always answer in 5 words or less but those few words stuck with me and still have an impact on my thoughts, feelings and actions. And because of and in spite of my Mother I have learned many things about life and about myself. I had a sharing relationship with Mom with the ongoing struggles of youth. And I miss her. Norman Vincent Peale said “If there is a spark of divinity,a fragment of eternity, a gamble of immortality in this earth, it’s found in trying to make a difference in other people’s lives”. I stand on the shoulder of a giant.